Concerned about the escalating cost of traditional college textbooks, the UConn Libraries is partnering with UConnPIRG and the Undergraduate Student Government to explore “open-source” electronic textbook alternatives. As commercial college textbook costs continue to rise, estimated as high as 812% or more than three times the rate of inflation since 1978 by Student PIRGs, many students are choosing to not purchase textbooks, jeopardizing their success in the classroom. 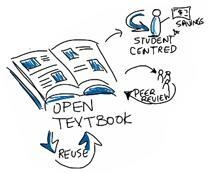 A new initiative at UConn, spearheaded by students from UConnPIRG and the Undergraduate Student Government (USG), is underway to investigate ways to educate students and faculty on the value of Open Educational Resources (OER) such as open source textbooks. Unlike traditional commercial textbooks, open source textbooks are made of content gathered from various sources that are freely available online and for everyone to use. Last fall, USG kick started the movement by voting unanimously to form a committee to explore the use of open source textbooks. The committee is being led by UConn’s Vice Provost for Libraries Martha Bedard and UConnPIRG Textbooks Coordinator Toyin Akinnusotu. To further strengthen their commitment, USG passed a resolution on March 11, urging faculty to submit their textbook requirements on time to the University, a requirement for all federally funded institutions. This was further supported by the University’s Provost’s Library Advisory Committee, formed to help direct the library on issues regarding scholarly information access and delivery. “These are important resolutions for UConn students to understand,” said Hilltop Dorms Senator Daniel Byrd. “As the cost of textbooks continue to increase exponentially, it is our responsibility to do what we can to both encourage the use of open source textbooks and ensure the disclosure of information about textbook costs.” Knowing the costs when the courses are listed is not only useful to students when considering taking a course, but also affects the buyback value of textbooks. “Much of the issue is simple education. There are dozens of open textbooks available online, for free right now that provide the same high quality information as their traditional print textbook options. It is our job to help inform faculty on the resources available to them,” said Bedard. Learn more about some of the open educational resources available via our helpful guide. A copy of the referenced report, “Open Textbooks: The Billion-Dollar Solution,” is available at www.studentpirgs.org/textbooks. This spring the art exhibits at Homer Babbidge Library feature William Shakespeare and his influence in performance, language, scholarship and pop culture at UConn and the artistry that results when microscopic objects are magnified a billion times and photographed. The exhibits run through June 15. An opening reception will take place on Thursday, April 2, from 4-6 p.m. In “The Play’s the Thing: Shakespeare at UConn,” Connecticut Repertory Theatre’s (CRT) Managing Director Matthew Pugliese and Assistant Professor in the Department of Dramatic Arts Lindsay Cummings show the creative work of the students and artists of the Department of Dramatic Arts and Connecticut Repertory Theatre. The scholarship of professors from English to Digital Media, highlights the many academic, social, and cultural ways we interact with Shakespeare on campus and in our lives. The University’s roots as an agricultural institution are also featured, focusing on herbs and their symbology in Shakespeare’s work. 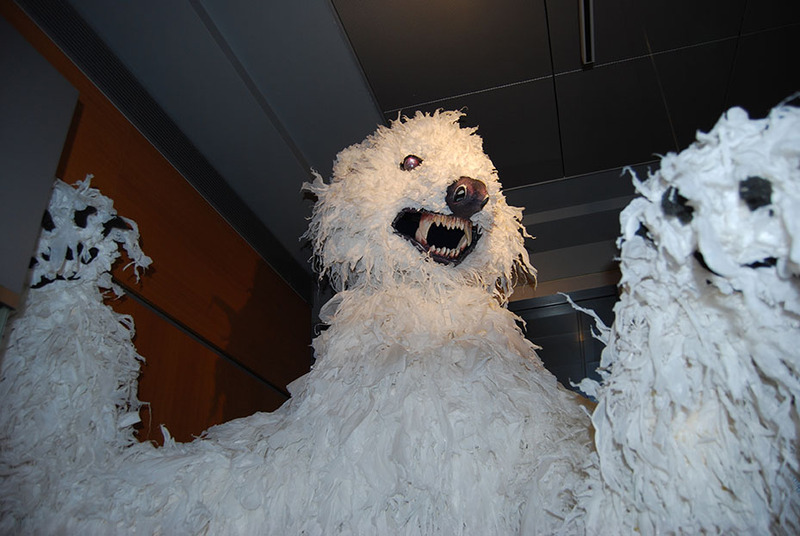 Ten foot tall polar bear puppet used in a campus production of “The Winter’s Tale,” on display in “The Play’s the Thing: Shakespeare at UConn. Last year, UConn was invited to join the Folger Institute’s Consortium. 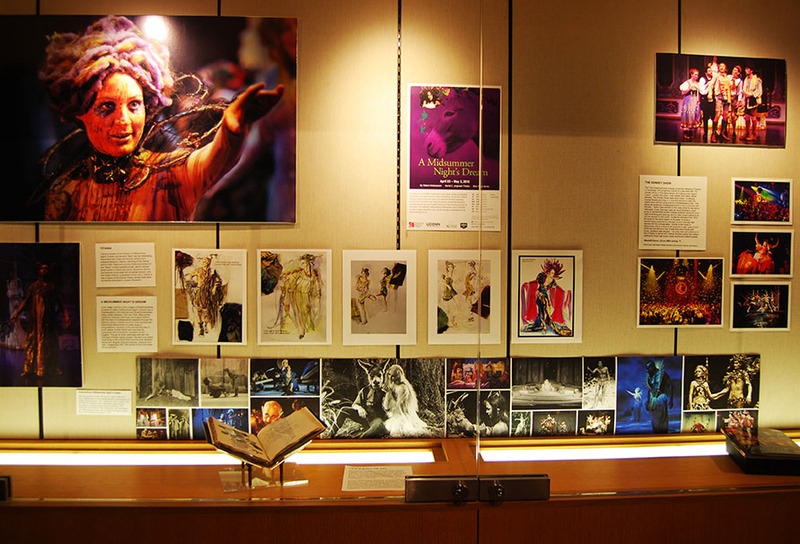 The Folger Institute is a center for advanced study and collections-focused research in the humanities at the Folger Shakespeare Library in Washington, D.C. The CRT will present Shakespeare’s most popular comedy “A Midsummer Night’s Dream,” from April 23 through May 3 in the Harriet S. Jorgensen Theatre. Using high power electron or optical microscopes, Professor Challa Vijaya Kumar, head of UConn’s Divisions of Physical and Biological Chemistry, and his Ph.D. students capture the natural world on the nano-level, creating awe inspiring images of natural materials that are as majestic as the Grand Canyon or Niagara Falls. 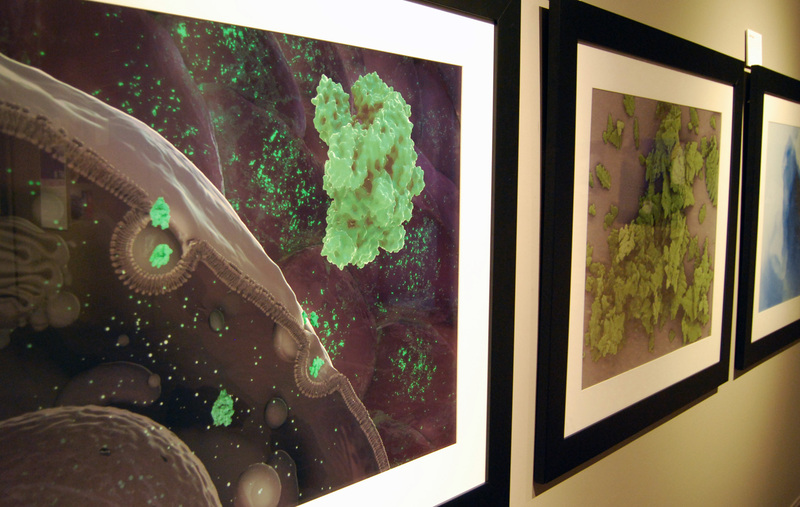 This “Art in Nanochemistry” exhibit is a collection of electron micrographs of nanomaterials from Dr. Kumar’s research group, created with support from the National Science Foundation, works of his colleagues at UConn, and also from the Materials Research Society Art-in-Chemistry annual competitions. Dr. Kumar and his group are investigating how these protein-DNA nanomaterials they create in the lab can be applied in enzyme fuel cells, DNA-solar cells, and neuroprosthesis for spinal cord repair. 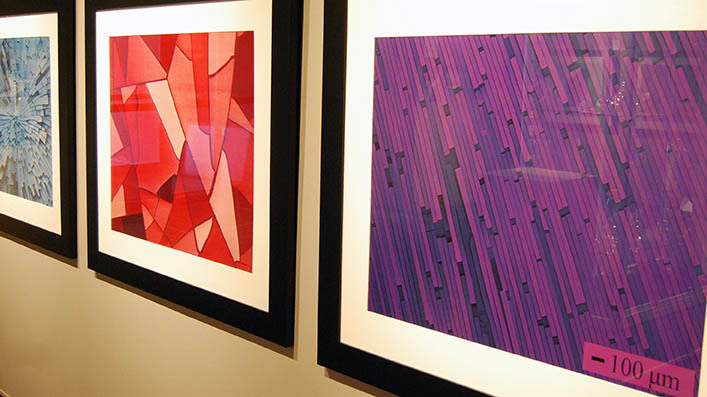 Two of Professor Kumar’s images, left, ‘Enzyme’ Stained Glass, and DNA Floor Boards.